The gaur have been trying to cross the highway for a while now. They stand in an alert huddle, their dark coats gleaming in the headlights of trucks and cars passing through Bandipur Tiger Reserve. This stream of traffic between Ooty and Bangalore seems unending and the speed limit seems irrelevant. Dusk falls fast and it is soon night. Forty-five minutes later, the gaur are still waiting for a pause in the traffic, simply to get across this ten-metre strip of road, in a Reserve where they are supposed to be able to roam fearlessly. The road that brings vegetables to Calicut, tourists to Ooty and seafood to Bangalore also slashes the forests of Bandipur in two. 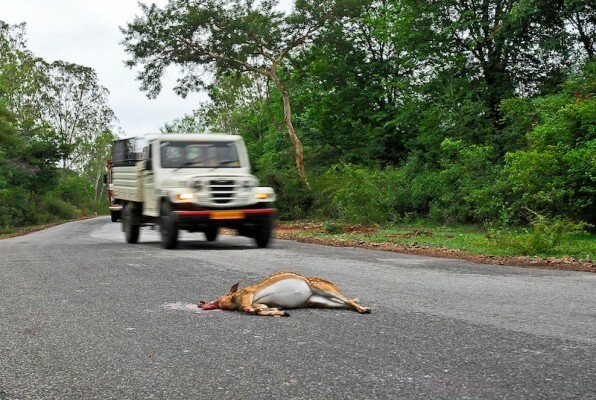 On this narrow 15-kilometre strip of asphalt, the lives of thousands of animals–from dragonflies and deer to tortoises and tigers–have been lost under the wheels of passing vehicles. But the same road also allows hundreds of wide-eyed travellers, like us, to experience the beauty of a deciduous forest and catch a glimpse of its inhabitants. To be sure, roads do serve the country and its people in critical ways. They are indicators of development, providing access to education, healthcare, markets and even a platform for people to hold protests simply by sitting on them and staging a rasta-roko. But for a while now, conservationists in India have been holding their own form of rasta-roko. In several of our sanctuaries and national parks, roads have become the subject of much controversy. Thousands of kilometres of roads weave through our forests, posing all manner of threats to our wildlife. As gashes in the habitat, roads open up dense and closed forests to invasive plants, to pollution from vehicles and to the garbage that always trails people. Trees along roads are also known to die off faster because of exposure. Retaining walls and safety barricades make parts of the forest inaccessible to small animals like turtles, which are unable to cross these barriers and sometimes die trying. All this, of course, in addition to the roadkills that smoother roads and faster vehicles inevitably leave behind. While standing together with conservationists in defending our parks against highway projects of other government agencies, the Forest Department is itself often involved in expanding road networks within reserves. Some length of dirt roads are certainly needed for patrolling and controlling fires, but some of our parks have a road density—one kilometre for each square kilometre of forest—that parts of rural India would certainly envy! What conservationists have been asking for is a more thoughtful planning of roads through forested areas. The Mysore-Mananthavady highway through Nagarhole Tiger Reserve is a case in point. A World Bank funded project to widen and resurface the highway raised concerns about the safety of wildlife in the Reserve. Rather than simply oppose the road, conservationists and local people suggested a diversion that skirted the forest instead of cutting through it. For a small increase in budget and a three-kilometre increase in length, this diversion would also provide highway access to 11 villages along the Reserve boundary. The alternative plan, predictably, was resisted by the government and only after protracted negotiation, finally approved. Just as we have set limits on what we can take out of our forests, mustn’t we also watch what we put in them? Evidence for the damage that intrusions like highways, pylons, canals and pipelines cause to our sensitive natural areas and their wildlife is indeed compelling. What we need now is a strong and clear policy to regulate their construction and ensure that, while getting the infrastructure our country needs, we do not fray the fabric of our forests further. May be as a partial practical solution, the road can be closed for a fixed number of hours and eventually animals would get used to this timing. Great article. This one of the major problems all over the world. Hundreds of animals get crushed on highways, and of course, no precautions are taken, but this should not extend to critical habitats and protected areas. I wonder if these roads are patrolled by Forest dept., and if there is a speed limit in these areas. I also wonder if there are signs warning of animal crossings – big bold signs! Its always a dilemma for a human to decide weather to take the ecomomy development path or ecology and conservation path. That’s where thsi kind of problem arises because of our solutions are very temporary.